Well, she’s back where she belongs, that sassy, brassy, inimitable force of good natured Dolly Levi and I hope she never goes away again, only this time she’s Bette Midler who used to be known as the Divine Miss M but now bids fair to eclipse all the Dollys of the world. A sweet faced lady in my aisle couldn’t resist sharing with me that she had seen Carol Channing as Dolly back in 1964 and beamed and beamed. “So did I”, said I. The packed, warm, friendly house racketed with conversations. Everybody was old friends of Dollys, even the new ones. Even when Danny La Rue was Dolly in London and that’s really stretching it. But --you just couldn’t help it. She grows on you. No, not like a fungus, don’t be mean. Dolly is certainly not mean. She’s generous. To a fault. Why are we going on like this? Dolly is one of the greatest iconic figures of the theatre, rivaling Hamlet for sheer, swanning authority, and far more pungent in her charms, although Hamlet is the peer of revivals in puissance and plenitude but Hamlet does not have Jerry Herman’s songs so goodbye to you, dear Prince, and all hail to the current Queen of 19th century Yonkers, Dolly Levi, soon to be Mrs. Vandergelder. Yes, the Widder Levi, still haunted by her dear, departed husband, Ephraim, is getting a mite peaked remaining buoyant being a meddler, a matchmaker, a dancing instructor, a counselor at law, whatever it says on those little cards she keeps dispensing from her amazingly capacious reticule. What she really needs is to be married to that grump of a widower, Horace Vandergelder, (hilariously grousing David Hyde Pierce) the half-millionaire, sole proprietor of the Hay and Feed store in Yonkers. Who wants to get married again but not to Dolly. He thinks. Ha! Dolly knows better. So matchmaker Dolly sets him up down in New York City with the beautiful young widow Irene Malloy (utterly fetching Kate Baldwin), who owns a hat shop, but Irene is a romantic and Horace sure as shootin’ isn’t. He orders his clerks, young Cornelius (charming Gavin Creel) and Barnaby (bumptious Taylor Trensch) to mind the store real sharp while he’s away in the big city. Ha! Again. These young fellers are not going to pass up an opportunity to visit the city themselves while the cat’s away. They’ve never been. Barnaby has saved up ninety cents from the pittance that Vandegelder pays them. Can they go to New York and get to kiss a girl for the first time ever and have fun on that? Dolly, meanwhile, has managed to steer Horace down to her old, beloved courting ground, the Harmonia Gardens with its famous dancing waiters, and, by happy coincidence, everybody else – it’s a farce, remember – which includes adorable Minnie Fay (adorable Beanie Feldstein) Irene’s shop assistant, who gobsmacks Barnaby as Irene gobsmacks Cornelius when they get to Irene’s millinery shop ( don’t you dare ask why) and have to hide when Horace, their boss, turns up there as he’s supposed to, but all suspicious as to what is going on, those two terrified clerks hiding in the shop in the darnedest places and ways. You gotta love farce. Dolly has also arranged to have Horace meet a substitute matchable at the Harmonia Gardens in case Widow Malloy doesn’t work out which she’s sure will happen and it does and the new matchable is a bust, too, wouldn’t you know, and who is there but Dolly, available Dolly. But first – but first – and possibly last –Dolly, in her red, sparkly gown and her crowning glory of waving red plumes comes sashaying down the Harmonia Gardens staircase as host Rudolph (Kevin Ligon) and adoring mob of dancing waiters – wow, do they dance, chefs, too – greet her with the anthem that gives the show its famed name, “Hello, Dolly”. If you listen hard, half the audience is singing, too. Now, how many showbiz gowns get to end up in the Smithsonian, like Dolly’s? Yes. It’s there. Next time you go… And how many shows end up becoming beloved old friends, better than new? Dolly. And how many Dollys like this Dolly? None. Get her while she’s hot. The line forms here. 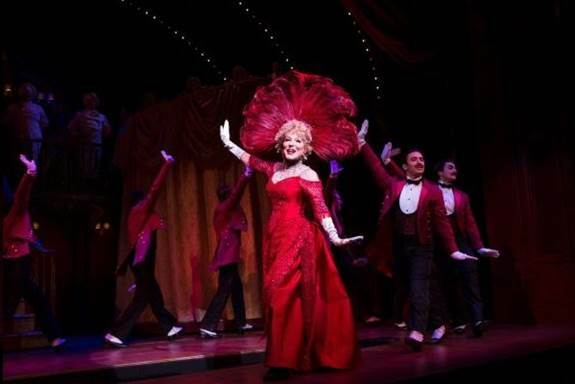 Hello, Dolly. At the Shubert Theatre, 225 West 44th Street at Shubert Allley. Tickets:$80-$409. Check availability. 212-239-6200. 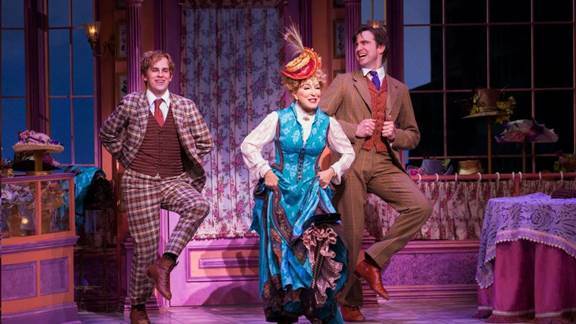 Donna Murphy as Dolly on Tuesdays after June 27. Open run.